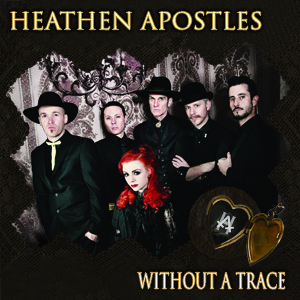 Some time ago, I had the privilege of reviewing Mather Louth’s CD from “Radio Noir” so I was very pleased to see the advent of Heathen Apostles. (Mather is one of my favorite musicians, and I also admire her impeccable fashion sense.) 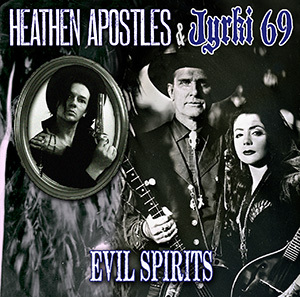 Not only does Heathen Apostles consist of Mather, Chopper Franklin, and Thomas Lorioux, Viktor Phoenix, and Luis Mascaro, all accomplished musicians, but the band also combines two themes very dear to my heart: Goth and the Old West. I have always thought that the Old West teemed with Gothic elements. Here was not the brooding poetry of the drawing room and absinthe fueled dreams , but the open menace of a strange, dangerous, and alien land. The merging of Gothic and Old Western sensibilities only seemed logical. 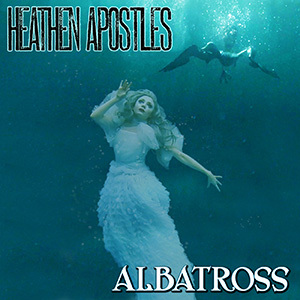 Several bands have taken this path, and Heathen Apostles are among the foremost. Mather’s wonderful voice and darkly charming demeanor are a perfect fit. The Old West conjures images of vast desolate spaces, grim conflicts, and lonesome death, punctuated by roughshod towns teeming with a disparate mix of sophistication and brutality. 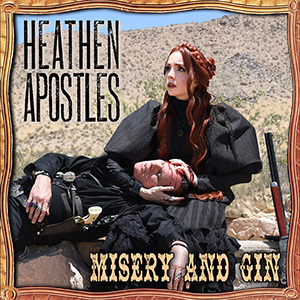 It is no accident that Heathen Apostles rises from Los Angeles, that musical Mecca of the Far West, and that their music is steeped in 150 years of history and musical lore. “Red Brick Dust” starts evocatively with acoustic guitar and low, moaning violin. 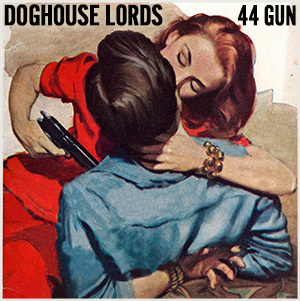 Electric guitar suddenly punctuates the song like shotgun blasts in the alleyways of old Tombstone. Vocals are pleading, yet dangerous at the same time. Late in the song, violin emerges Paganini-like with a brief, impulsive burst. Ominous, yet rich violin opens “Dark Was the Night”. Masterful percussion drives the song with a rocky gait, and the mandolin adds a definite western flavor. Vocals are exquisitely layered, sultry and moody. ‘Forget-Me-Not” is a rollicking tune, with sharp, syncopated percussion and edgy banjo, as the violin hovers in the background, only to suddenly rise with the fervor of an assassin. Vocals are strong and confident, yet with an underlying sense of foreboding. “Never Forever” has a very edgy, evocative intro, with guitars in tandem and violin. 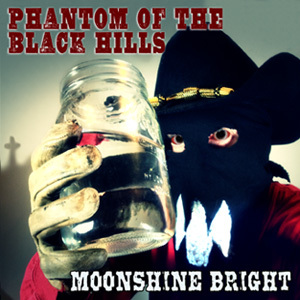 They are joined by low-key, yet striking banjo that reminds me of some of Neil Young’s works. Vocals are slow and expressive. The song slowly rises in volume, and vocals drop to an eerie whisper at about 3:06. Then suddenly, some wonderfully cowpunk-ish guitar erupts, and Mather’s superb vocals rise to a crescendo. 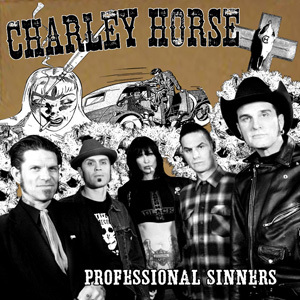 There is a cool spaghetti western vibe adeptly mixed with ’80′s alternative that makes this is a very compelling song. ‘The Reckoning” ramps things up with Saturday night saloon exuberance and energy. The intro reminded me of the movie “Dead man”, and there is a vague steampunkish element somewhere here amidst the rattling percussion and gypsy flourishes. 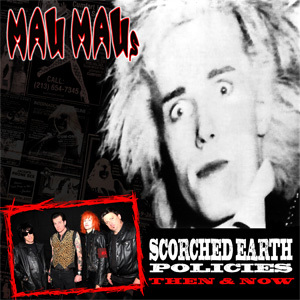 Brief flashes of fuzz laden guitar add to the demented carnival atmosphere, as Mather’s vocals are both enticing and dangerous. “The Dark Pines” is one of my favorite songs here. With what I call a ‘Western Cabaret” style, haunting mandolin and menacing violin accompany Mather’s darkly vibrant vocals. 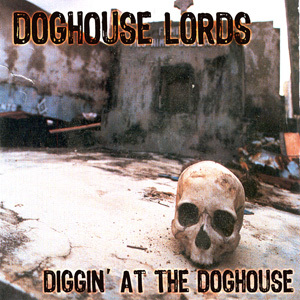 Rousing guitar licks and driving percussion propel the song to a very ominous finish. “It All Came Down” starts with a great little vignette of a tinny Blues song playing as the actions of various firearms are worked and clicked. 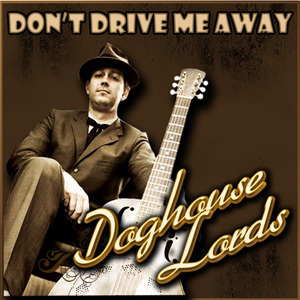 Then the song launches with syncopated percussion, slow banjo, and low bass that brings a smokey Speakeasy to mind. Guitar is low and menacing, and the organ gives an unsettling edge. This is further heightened by the sardonic, yet sinister male-female vocals that deftly weave around each other. “Murderer of Souls” is awesome! This is pure Cowboy Gothic for the 21st century. 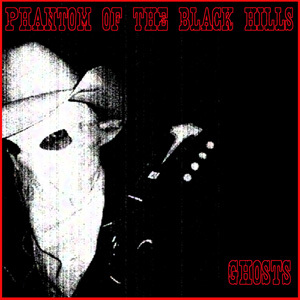 There is some excellent post-punk guitar and sparse, eerie banjo over a gripping electro background. Very edgy violin emerges, then grows stronger as the song progresses. Percussion is as rhythmic and pounding as hooves along a lonely trail. Vocals are smooth, with a nice touch of layering, which heighten the sense of desolation and fatalism that the song evokes. “Darkness of Dawn” is more Cowboy Cabaret, with Mather’s soulful vocals, wandering violin, and sparse banjo. The percussion canters along, while the guitar adds a darkly expressive touch, especially on the moving, yet dynamic refrain. This song makes me envision a high mountain range on the horizon, with miles of emptiness behind you. “Lonesome Whistle” is languid and moody, with an ominous carnival-like beginning. Vocals are refined, yet a bit ominous, while the guitar has a definite edge. The backing atmospherics are measured, and inexorably move the song towards a doleful finish. “Boot Hill Hymnal” is superbly produced, and the arrangements are precise and striking. The band clearly takes their music seriously. 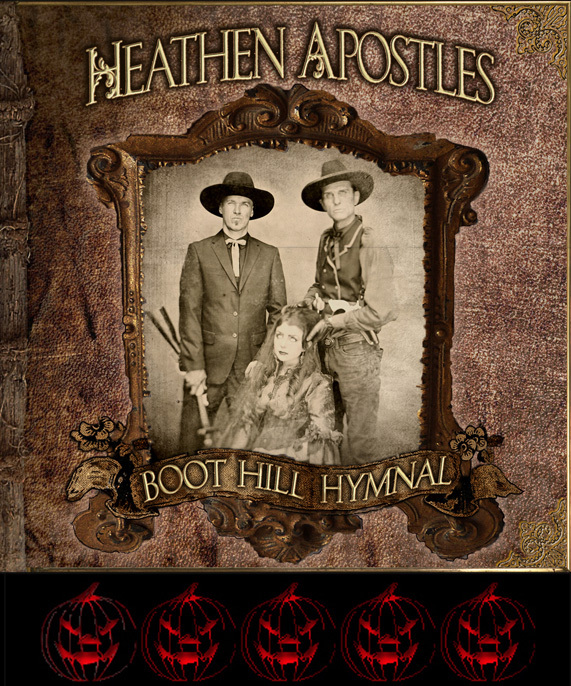 The wonderful thing about “Boot Hill Hymnal” is that Heathen Apostles are not bound by the usual boundaries. For example, they are not just a Gothic band that dresses up in Victorian and Old West fashions and makes a few literary references amid the standard doomy droning. They are not a Steampunk band. They are not a Country/Roots band trying to be “authentic”. 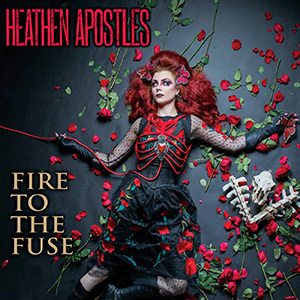 Heathen Apostles have skillfully created their own innovative sound and vision. There is a delightful variety of musical here, including Gothic, Cabaret, Blues, and Gypsy Jazz, that is deftly bound together by the band’s dark and sometimes brooding sense of a bygone age. This is all filtered through a wholly contemporary level of musical excellency that is both relevant and unique. This is a very fine work, indeed. I look forward to hearing more from Heathen Apostles. 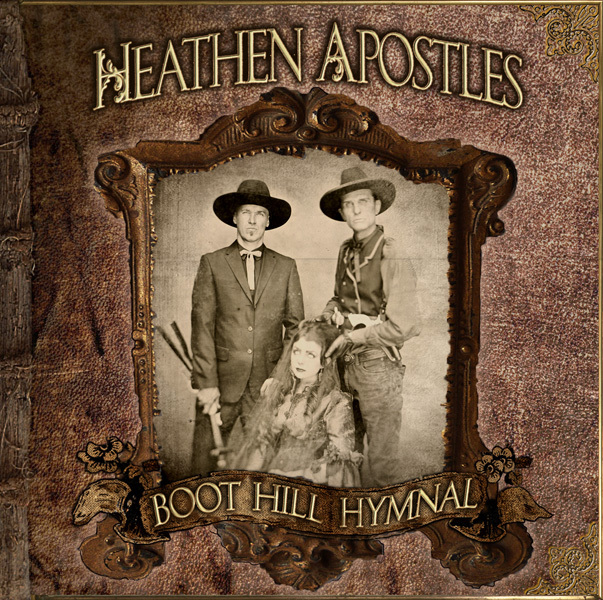 It’s not often a band surprises me with something strange and different, but that is exactly what Heathen Apostles did when I heard the first verse of their debut album “Boot Hill Hymnal”. The musicians here are well known to me with vocals by Mather Louth (Radio Noir) and Chopper Franklin (The Cramps) handling the guitar. However the sound that hit my ears was nothing like this groups individual past projects. Some are calling this “Gothic Country” but I feel this is misleading. When one hears the term country, one generally thinks of modern country of the last say 20 years. 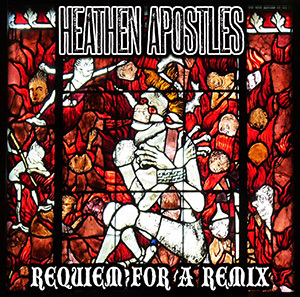 Heathen Apostles sound is birthed by the music of the far past. 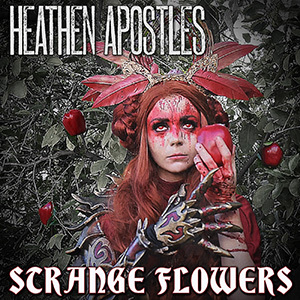 Unlike the music of bands like Fields of the Nephilim that blend a southern country or cowboy image into the Gothic sound, Heathen Apostles transports the listeners into another time frame completely. I personally prefer the label of “Dark Roots” music to describe their morbid melodies. The album begins it’s morbid journey of murder ballad Americana with the toe taping track “Red Brick Dust”. This song is a great welcome to the band’s sound. It’s a familiar sounding structure while introducing the listener to this new sonic world. It’s the most rock or punk groove on the album and it’s chorus hits vocal melodies that are reminiscent of the Radio Noir song “Desert Woman”. Not to contraindicate my statement from earlier. The album really descends into it’s signature style with the second track, “Dark Was the Night”. Incidentally my favorite cut on Boot Hill Hymnal. This morbid tale of the loss of a loved one quickly transports the listener into the desolate landscape of a western town in the late 1800′s. The somber tone of Mather‘s haunting vocals are at flat out beautiful. The music now filling out the sound with fiddles, guitars, and mandolin. It’s easy to close your eyes and find yourself in a dark and haunted town full of lawlessness and death. “Forget Me Not” is a toe tapping tune that has a touch of Nick Cave‘s Murder Ballads in it. It’s a ghostly tale that really shows off the incredible song writing this group possess. Which is very evident in the cohesive nature of the whole album. This is not a “Let’s give this sound a try.” type of album. 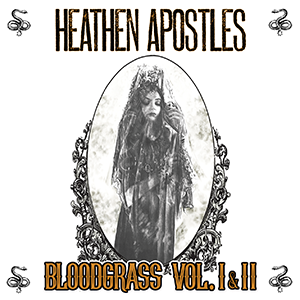 Heathen Apostles throws everything into this album to make a truly authentic experience. 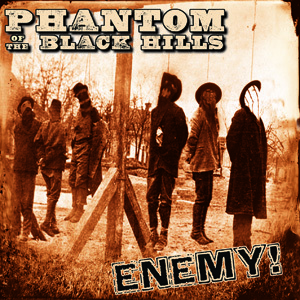 My mind floats thorough the dark side of the Wild West and the Civil War while listening. Mather is no stranger to creating different time periods. Her work with Radio Noir invokes a 1920′s/30′s atmosphere. I am not going to go song by song in this review. Suffice it to say every song is wonderfully crafted and they are all worth a good listening too. 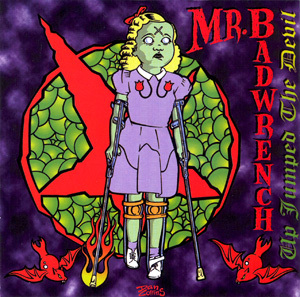 However, there are a few stand out tracks for me, in addition to “Dark was the Night”. “Murderer Of Souls” is a powerful track that has a huge sound and, well, just plain rocks. I could easily see this as the theme to some dark western or a Southern horror tale. The albums closer, “Lonesome Whistle”, is a simple yet strong melody that leaves the listeners with a bleak feeling and a want of more. Then there is “The Reckoning”. Returning to the toe tapping beat this song has a huge story and sports an apocalyptic feel. Like a steam train out of control and spewing fire from it’s stack. 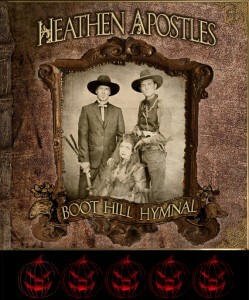 A killer track that also has a great video, the first video from Boot Hill Hymnal. 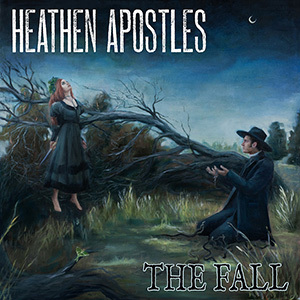 This debut from Heathen Apostles is a wondrously crafted album that weaves a world all it’s own. It’s powerful, somber, toe tapping, and dark. 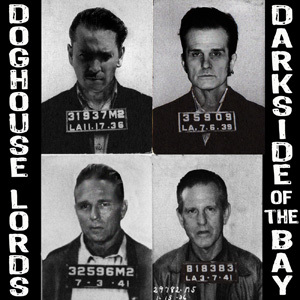 This is a group distended to leave an indelible mark on the Dark Alternative scene. I am looking forward to the next offering from these macabre masters of melody. Until then I will set Boot Hill Hymnal on a loop. This is a must have album for just about everyone. 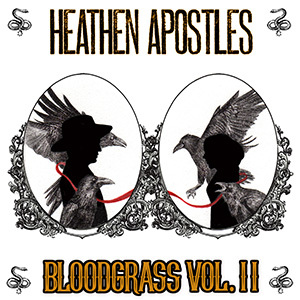 Do yourself a favor and get the whole album and get lost in this wondrous world known as Heathen Apostles.